How many times have you wished you could give a tailgater a piece of your mind? The Messenger is a silent alarm and scrolling message system that fits in the back window of your vehicle, enabling you to send messages of caution, advice or emergency to other motorists. Program 10 of your own personal messages. Let the person behind you know what you're thinking. Have your own programmable electronic bumper sticker in your back window! BACK OFF - YOU ARE FOLLOWING TOO CLOSE! alerting everyone behind your vehicle that it is stolen. 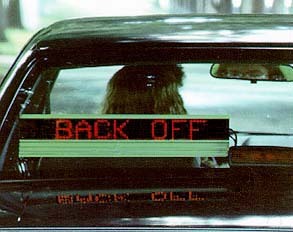 Automatically displays the message **STOP** when you step on the brake. Automatically displays the messages <-- TURNING and TURNING --> when turning left or right. Installs in the back window with provided hardware. Using the Messenger may qualify you for a reduction in your insurance premiums. Tonka Tronix is currently seeking a buyer for the rights to manufacture and sell The Messenger. This would include all design information: Schematics, Software, PCBs and B.O.M.s. We can also assist you in selecting a contract manufacture for a turn key operation. If you are interested, please follow the link below to contact Tonka Tronix. Return to the home page of Tonka Tronix.